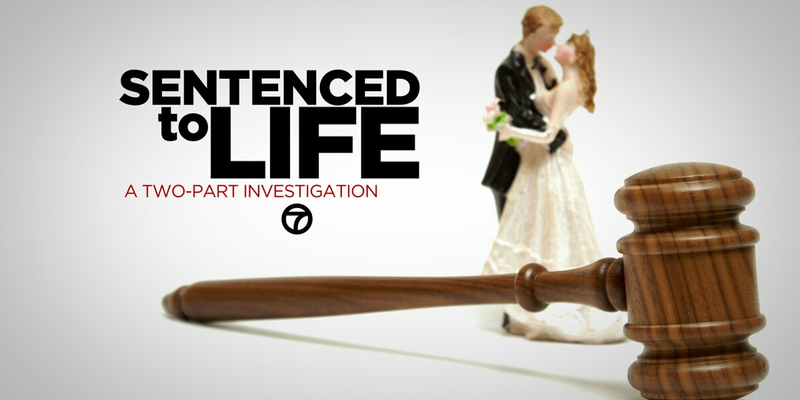 SMITH COUNTY, TX (KLTV) - An East Texas judge has come under fire for allegedly including a requirement of marriage in his criminal probation. After reports of the unusual marriage order Judge Randall Rogers gave a Tyler man in July, other East Texas residents came forward with similar accounts; other cases of more couples whose sentence in criminal court included matrimony. According to court transcripts, Rogers gave 21-year old Josten Bundy a choice during a hearing on a misdemeanor assault charge. Rogers told Bundy he could either marry his girlfriend, 19-year old Elizabeth Jaynes, or spend 15 days in jail. Michelle Powell, of Chandler, watched news reports of Bundy and Jaynes in disbelief. "It was so much like my case," Powell said. "I was heartbroken for them, because I know the pain." In July of 2015, Powell and her co-defendant boyfriend were facing misdemeanor shoplifting charges for failing to check $100 worth of items out through the self-check out line. During the initial hearing, Rogers asks about the couple's marital status, according to court transcripts. "Are they husband and wife?" Rogers asks. "If you get within 100 feet of him during the probation, you go to jail," the judge stated. Powell was facing a two-year probation and was in court without attorney representation. "I didn't want to leave [my boyfriend], I love him," Powell said. "I didn't want to be away from him." At the hearing, Rogers asked, "Do you two want to run off and get married and come back?" The pair agreed there in court to get married; an emotional decision according to Powell. "That made me cry, you know, that that's my proposal," said Powell. "I was very scared. Having never been in trouble, it was just a different experience for me." The court gave them two weeks to walk down the aisle and return with their marriage license. In the transcripts, Rogers said, "I am not going to force you" and "this will turn out to be a life sentence." Less than 10 days after the rushed wedding, Powell said her now husband received a call from the court dismissing any charges against him. Powell testified during the first hearing that her boyfriend had been on the phone and preoccupied as she went through the checkout line. She now says she wonders why the marriage condition of her probation was even necessary. "It's like a life sentence," Powell said. "Even though I don't mind being married for the life, it wasn't supposed to be forced on me. It's hard that you didn't get to plan it that way you wanted to plan it." A father from Frankston has similar questions about his son's 2012 case. Bill Bull's 27-year old son, Benjerman Bull, appeared in Rogers' court in December of 2012 on a misdemeanor theft charge. According to obtained hearing transcripts, Benjerman and his girlfriend and several females were arrested for taking items from a department store in the women's dressing room. During the hearing, Rogers' tells the defendants they cannot be around each other, but Benjerman and his girlfriend were living together at the time. "Then you are going to have to move," Rogers says in the court transcript. "You go around him on probation, you go to jail. You figure out how much that fiance cares for you. Now, if you get married, that's a different story." Benjerman appears to hesitate and responds, "We will have to think about it ... talk about it." Rogers gives Benjerman 30 days to make a decision. "If they don't get married within 30 days, they separate. They go around each other, they go to jail." And quickly wed, they did, but Benjerman's father Bill said things were rocky for the couple after the nuptials. "The marriage did not benefit [my son], it made things worse on his way of life," Bill said. "It made it worse on his emotions, he was under distress all the time. It created more financial and emotional problems." From Bill's perspective, the hardest part of this court-ordered marriage would come during his darkest days. He said his son was considering a divorce, but around four months after the wedding, Benjerman suffered a severe asthma attack that sent him to the hospital on life support. Benjerman's new wife now had rights only a marriage bond could bring: the ability to make medical decisions. "It upset me quite a bit knowing that he was already brain dead and was not going to survive," Bill said. "That marriage certificate enabled her to keep him alive longer and for no reason. My son would not have wanted to live that way." Bill said he contemplated filing a complaint with the state commission on judicial conduct, but after his son passed in 2013, he wanted to put it behind him. Then, he saw Bundy and Jaynes' story, reminding him of how much he disagreed with what happened during his son's hearing. Judge Rogers declined to comment on his sentencing practices, or on these specific cases. He no longer presides over Bundy's case after he requested a recusal in light of the media attention surrounding the case. It's unclear from court records why co-defendants would be allowed to co-habitate if they were married, but not if they stay unmarried. However, in transcripts from Powell's case, Rogers says that he doesn't consider this approach to be a "shotgun wedding" and that he is leaving the choice up to the couple.